Today’s world of digital marketing is made up of dozens of specialized niches. Content creation, social media, publicity, partnerships, SEO and one of the largest components: paid media. Paid media contains everything from pay per click ad campaigns to sponsored Tweets. This new and ever changing piece of the digital marketing pie can be overwhelming. Luckily, we had three paid media experts share with us their take on the past, present and future of implementing paid media into the digital marketing spectrum. 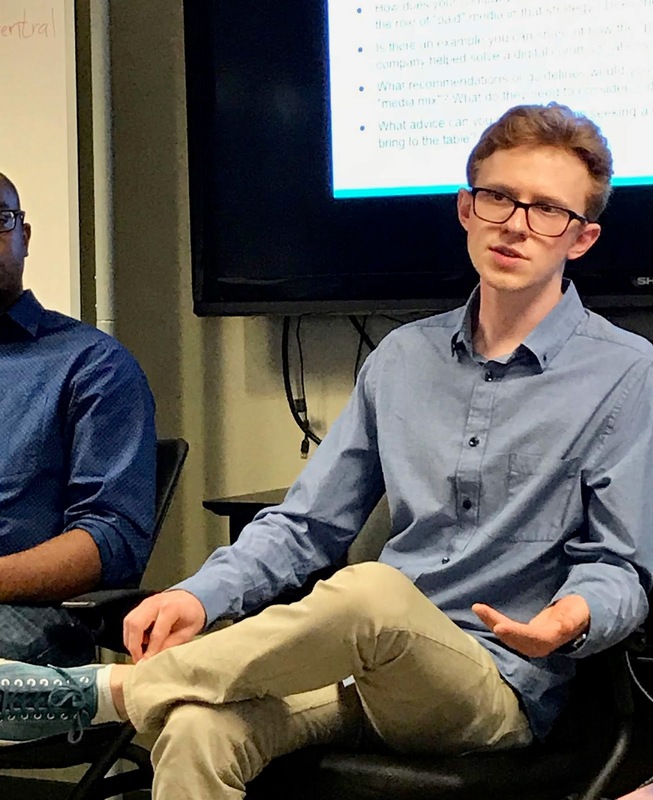 John Hughes (Domino’s), Jorel McCree (Pinterest Automotive) and Jack Takesian (Google) weighed in at the most recent Center for Digital Engagement’s Summer Clinic Speaker Session. John told us his story, “I had a strange career path…” A series of ups and downs led John to advertising and marketing, where his passion was. In his first job, John didn’t even know what media was! Marketing has evolved from an “analog” ecosystem of senders, facilitators, publishers and receivers to an explosion of information and activity, in all directions. Currently leading Domino’s in-house paid media team, John said he “…Didn’t have a background in half of it, but learned a lot of quickly.” Paid media is continuously evolving and to stay relevant you have to, too. 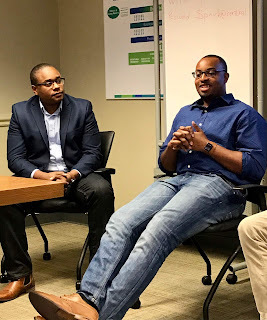 “I wanted marketing to be my passion.” Jorel McCree’s journey started with an EMU practicum course and lead to Ford Motor Co. creating their first digital marketing internship for him. Based on his experience, he left Ford to work for an agency, he now works for Pinterest. "I learned paid search, SEO, paid social. You jump in and have no idea what you're doing. And then, just keep learning." Jack also experienced the digital transition first-hand. His first job at an agency motivated him to learn about media analysis, media planning and digital ad trafficking. "It was trial by fire. It was digging into all the platforms I could, trying to absorb all the knowledge I possibly could." Jack's ability to stay ahead of the curve and self-developed skill set lead to Google recruiting him. Disruption in technology and the marketing environment lead to new roles for John, Jorel and Jack. Their ability to be flexible and constantly learn, positioned them to advance not only their careers but in their ability to market effectively. So how do you use paid media? Before implementing anything Jack says to define "What success measures you are going to identify and how you are going to get there." What are your key performance indicators (KPIs)? Once you are able to define success, you can begin to track that success, then use the data you have to build upon it and weed out what is not working. According to John, "Paid media is a sales driver." Everything is based around finding the inefficiencies and continually getting better. "You can beat your competition by iterating faster." How do you do that? John says test, test, test. Build upon the metrics that you collect. Jorel suggests starting with the tools available online, especially the "big guys," Facebook and Google. With little experience necessary, you can quickly and easily see what is happening and fine-tune your marketing impacts on the audience. While paid media can have a huge and positive impact on a client, it can be difficult to convince them that spending the money is worth it. "Pitching any paid media channel as a solution to their problem is key." Jack says clients need to think of paid media as an investment, not a cost. When building your marketing strategy, the panelists suggest asking: how much is each lead worth? Digital marketing technology allows you to measure the success and breakdown the cost, to show a customer the value of paid media. When allocating budgets for paid media or any other component of the media ecosystem, it is important to evaluate the value, impact and effectiveness of the channel. In a large company, such as Domino’s, John uses A/B testing, optimization towards specific data metrics and econometrics. For smaller budgets, Jorel suggests using free tools such as surveying. Whatever the case, the panelists stress the importance of keeping your audience engaged. Jack says "Everything fits together,” be prepared to show your client the success of what you are planning and the value of what you are doing. To end the session, the panelists shared some tips for individuals looking to break into digital marketing. Their unanimous tip? Passion will drive you to succeed. Jorel says to “Find your North Star. It’ll keep you going in the direction you plan on heading. Let that passion show.” John, Jorel and Jack have become experts in paid media by continually pushing themselves to learn more. Jack suggestions “…Having a skill that makes you crucial.” Find the problems, not only the solutions. By going above and beyond, and displaying that skill set, you make yourself invaluable.